Photographers everywhere will capture images from time to time that hold extra special personal meaning. Perhaps an extreme experience like a bungee jump selfie; fulfilment of a lifelong travel quest, photographing the Taj Mahal in India for example; technical excellence, achieving the perfect lighting balance in a studio shoot; or a precious family moment of a loved one who’s passed, something that can never be repeated. Revealing the stories behind these pictures allows others to also share their appreciation for the photo. This is what we are starting today: ‘Right Click,’ a regular photography post giving information about a certain image that we’ve captured at some point during our photography adventures. Jade’s dance moves captured just right. We kick off the series with this picture from December 2010 of British dancer, Jade Samways, shot at our studio at the time in Deptford, London. 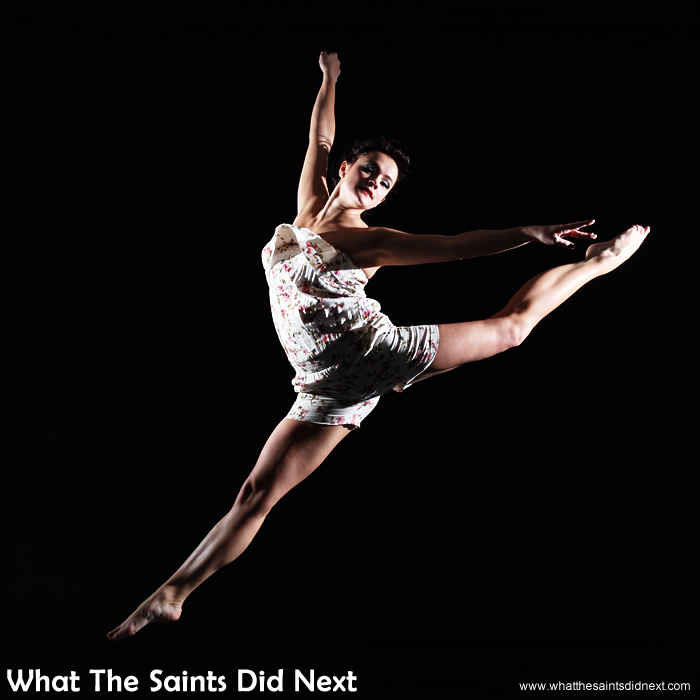 Jade and her friend Lois, contacted us for a dance portfolio shoot, which had to include dramatic ‘airborne’ shots. We said yes without having done it before, and then Sharon and I set about figuring out how it would work. Taking turns, one of us operating the camera the other jumping in front, the results weren’t great. They lacked the crisp, sharpness that was required. Research revealed we should drop the big studio light heads and use small strobes instead. These throw off a faster burst of light, better for ‘freezing’ the action. No surprise strobes are also referred to as speedlights. The day before the shoot Sharon and I spent half a day testing with the strobes – very tiring all that jumping! But we eventually got it just right. The next day we met Jade and Lois, two lovely people who were also clearly very talented dancers. After shooting various poses and looks it was then time for the ‘flying’ dancer shots. The ceiling lights were turned off and the room was nearly completely dark, only the glow from a red lamp in the corner. A small cross was marked on the floor with masking tape; the girls would time their run and jump to be in position above the cross as the camera clicked. Two strobes were set up on light stands either side of the cross. I pre-focused the camera then set the lens to manual focus so it wouldn’t drift. All the preparation paid off. Everything worked perfectly and we nailed incredible shot after shot for the girl’s portfolios.